High-performance data-intensive query processing tasks like OLAP, data mining or scientific data analysis can be severely I/O bound, even when high-end RAID storage systems are used. Compression can alleviate this bottleneck only if encoding and decoding speeds significantly exceed RAID I/O bandwidth. For this purpose, we propose three new versatile compression schemes (PDICT, PFOR, and PFOR-DELTA) that are specifically designed to extract maximum IPC from modern CPUs. We compare these algorithms with compression techniques used in (commercial) database and information retrieval systems. Our experiments on the MonetDB/X100 database system, using both DSM and PAX disk storage, show that these techniques strongly accelerate TPC-H performance to the point that the I/O bottleneck is eliminated. Zukowski, M, Héman, S, Nes, N.J, & Boncz, P.A. (2006). 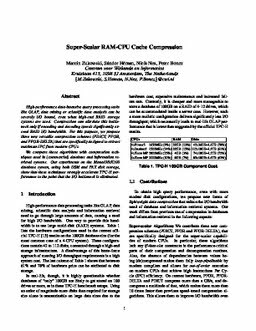 Super-Scalar RAM-CPU Cache Compression. In Proceedings of IEEE International Conference on Data Engineering 2006. IEEE.